Considered one of the nation’s smallest towns, Buford is located in southeastern Wyoming between Cheyenne and Laramie on the Interstate 80 and consists of 10 acres with a convenience store, gas station, and modular home. The town was first founded during the construction of the Transcontinental Railroad in Wyoming and at one point boasted a population of about 2,000 people, mostly railroad workers. However in 1980, when Don Sammons, first moved in with his wife Terry and their son from Los Angeles, they made up the whole population. After the death of his wife, Sammons bought the entire town in 1992 and kept the lights burning in the tiny town for longer than most expected. He ran Buford’s only General/ Hardware/ Liquor Store and gas station. He was also considered the town’s mayor. His son moved away in 2007, making Don Sammons the only resident of the town. 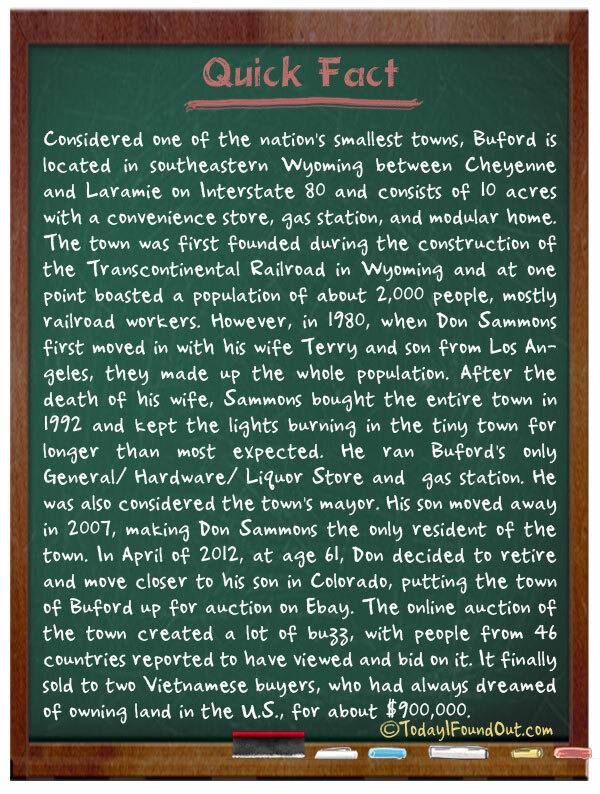 In April of 2012, at age 61 Don decided to retire and move closer to his son in Colorado, putting the town of Buford up for auction on Ebay. The online auction of the town created a lot of buzz, with people from 46 countries reported to have viewed and bid on it. In 11 minutes it sold to two Vietnamese buyers, who had always dreamed of owning land in the U.S.